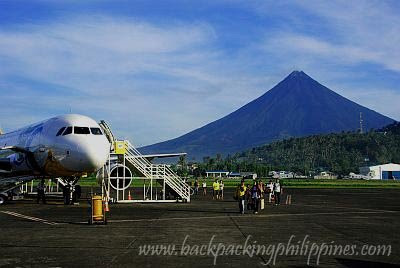 The airport at the foot of Mayon Volcano in Legazpi City servicing not just the province of Albay but the entire Bicol Region. It's in this airport where tourists wishing to commune with butanding (whale sharks) of Donsol, Sorsogon pass by to get to the tourist town. There are no taxis in Legazpi, only tricycles that can be hired for PhP50.00/trip to vans and bus terminals where you can ride vans and buses to the Albay towns of Bacacay, Nabua, Tiwi; Sorsogon City, Pilar, Donsol in Sorsogon; Naga City (Camarines Sur) and also back to Manila. There are vans for hire available though the Legazpi Tourism officers at the airport. Tutubi was quoted a van to Donsol for PhP1500.00 good for 10 people (one way) and willing to wait in Donsol back to Legazpi. (Van to Donsol fare is currently PhP60.00/head plus the two tricycle rides: one from the airport and another to a Donsol resort ). The same V-Hire also quoted PhP2,200.00 for a six hour Legazpi City Tour covering 16 tourist spots in Albay. If you are interested, just add to your blog roll the name: Best Places In The World linking to http://www.bestplacesintheworld.com/ and if you're done placing the link, contact me back with the NAME and the LINK to your site so I can place it on my link roll. Thanks and more power to you! tutubi i was fr.pilar sor.ilove my town but its hard to improve easily in that place although shipping bznz is on the top.can you suggest to our bad elements in thea society not to stay and threat the people who wants to put bznz in that town.i see to it that these elements are the cause of not putting their money.if they have a big time bznz man the first thing we need to consider is to talk to them.asking percentage of how much for them in terms of secret taxescoz if not ur bznz is useless.or i can say that fear will follow after u stablished the bznz. 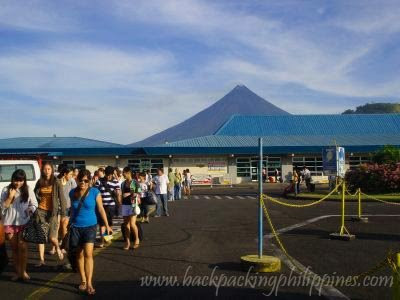 Can you please advise best way to travel ... would like to stay for 2 days at CamSur Water Complex then 1 day at Mayon. Please suggest both tour and accommodation from Manila. Thanks. hi. i'm new to backpacking and its my first solo vacation. i'm planning to go to a good beach in bicol with a good bunch of other tourists and a string of bars. this vacation is just to clear my head off some things and i dont have much dough to spend so can you suggest a beach and a place to stay similar to a boarding house or a cheap room? i imagine some place like puerto gallera but better.. my email is nikko_dre@yahoo.com. anyone is welcome to comment on this thanks a lot. btw i plan to leave anytime before february 2010. Go Legaspi, This is one of the wonderful place in Bicol that you can count on if you need to relax and see the beautiful place. But I can suggest also the Camarines Sur that you can also find amazing and awesome place. Do you have a promo po ba from Legazpi City to Boracay (via Caticlan)? We're 10 and planning to visit Bora 4th week of Feb or 1st week of March. Thanks! Im planning to go to legaspi this march 2-4(3D/2N), 2 pax only. Can you recommend me a tour package which includes hotel accommodation, CITY Tour and butanding watching? And how much would it cost, per person or 2 pax already? Be glad to hear from you soon.. thanks!